This double-decker is intentionally painted with bronze-gold colour, the rationale behind is to highlight its rareness in the market. 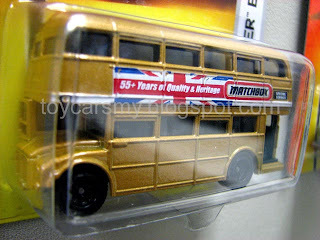 The bus is produced for Matchbox 55th year anniversary, it is limited in its quantity (lesser than T-hunt$ compared to Hotwheels). 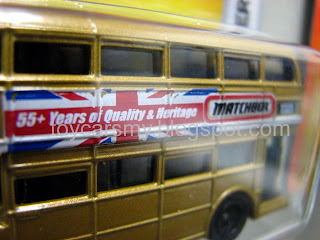 Matchbox name started in 1953, the company founded in 1947 as industry die casting company by Leslie Smith and Rodney Smith in Homerton, East London. Routemaster double-deck bus was introduced in London in 1956 continuous service in London until 2005, and currently remains on two heritage routes in central London. 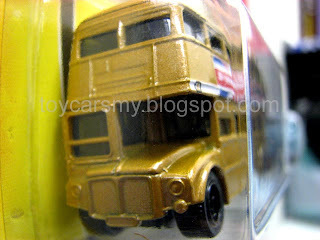 Therefore, the routemaster is selected as the symbolic model for its anniversary. Remark: This is an old post I wrote months ago, for seasoned collectors please bear with me.